Adam Handling has come a long way since reaching the finals of Masterchef: The Professionals in 2013. The young Scot took up residence at St. Ermin’s Hotel in Westminster, earning decent reviews for his modern, technical dishes as head chef of Caxton Grill. Now 2015’s Scottish Chef of the Year is taking his first leap into the world of entrepreneurship – hence the name of his new Spitalfields eatery, The Frog. Arriving at the restaurant in Ely’s Yard, around the corner from the Market, you’re struck by the amount of competition surrounding it. Food stalls, popular with locals and tourists, line the square, and signs for next door’s Sunday Upmarket remind you this is an area spoilt for culinary choice. How do you stand out in such a colourful landscape? Handling’s answer is to blend in with the crowd. The Frog’s décor is typically Shoreditchian. The tables and chairs are mismatched in a deliberately laissez-faire manner, messages are scrawled on the white walls, which are otherwise filled with empty photo frames (I’m told they’re just placeholders until a showcase of work by local artists is ready). 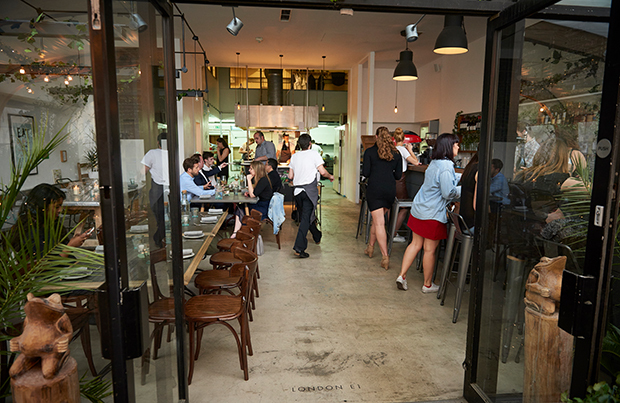 The kitchen is open too – so open, in fact, that you can see the chefs’ changing room at the back. It’s so perfectly hip that it feels a bit forced, a bit pretend. The dishes are described with simplicity – a list of ingredients rather than a verbose portrait – and I admire that. The à la carte has plenty to offer, but the five-course tasting menu, reasonable for its ilk at 45 quid a head, is the most popular choice in the room. And if you’re still in any doubt that the place is aimed at local hipsters, the inclusion of a £25 beer pairing option should convince you. The Frog puts far more emphasis on its bountiful selection of craft beer than its wine, and that’s fine by me. But ultimately, it’s the quality of the food by which a restaurant lives or dies, and the tasting menu lets you try much of it. And all ingredients, I’m told, are locally sourced. There are snacks: a lovely, fatty, pork croquette with lovage; a sweet beetroot fest that’s a little too sugary for my taste; and a delightful cracker dotted with chunks of salt cod and little gems of citrus and pickled cucumber. Then warm slices of sourdough with chicken butter, which made the bread taste like it’d been dipped in a meaty broth. Very nice. The menu’s substance was made up of three dishes: two fish, one meat. These were worth the £45 alone, though they weren’t without fault. The mackerel, cooked to perfection and accompanied by apple, avocado cream and titbits of fresh lime, was overly sweet. The roast hake, again flaky and divine, was ably supported by the smoothest mash I’ve ever had, and that moreish aniseed flavour of tarragon. But the lamb, described on the menu as ‘Lamb, artichoke, wild garlic’, was so wildly garlicky as to make it unenjoyable. The only respite came when you dipped into the puddle of cream underneath everything, which made me wonder if drizzling the sauce on top of the meat would have helped the balance of flavours. The supplementary cheese course at just £4 was a treat. A doughnut filled with gooey fondue, and hints of truffle running through it. Even the existence of a palate cleanser on such a menu is a pleasant surprise; for it to feel like a bona fide dessert was even better. The crunchy almonds with milk ice cream and dill would make for a delightful finale, but the best was yet to come. Burnt honey doesn’t sound too appealing on paper, but sweetened with a malty pomade and toffee, the bitter shards of honeycomb were a winner. If you’re worried about going home hungry – some tasting menus can be stingy with their portions – don’t be. I had to undo the button on my trousers halfway through. Happy that I’d had plenty of value for my money, I took up the option to ‘Buy the chefs a beer’ for £4 each. Luckily the team is still quite small – I counted – but they definitely deserved a drink. The menu might be priced to draw in customers – the place is only a few weeks old, after all – so go and try it soon. Such was the quality of the food, I don’t quite know how they’re making a profit. But I hope they do, because I’ll certainly be returning. With plans for more restaurant openings in the coming months, this is just the start for Brand Handling. And for a first leap into the unknown, The Frog has landed well – not perfect tens, but certainly with a brilliant flourish.